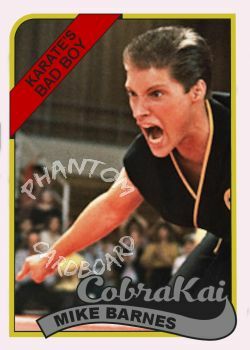 Phantom Cardboard: Your Karate's A Joke! I love The Karate Kid 1-3, and probably in that order. Although, I may have seen 3 the most due to how much it came on cable in the early '90s. While it's not as good of a story as the original, or has the scenery of the first sequel, it does have it's moments. Mike Barnes, Terry Silver, and Sensei Kreese make for a formidable antagonist triple threat, and then throw in "Snake" for a good 'just want to punch that guy in the face' factor. Two things that always bothered me about the movie. For one, it's the only one where Daniel San doesn't exactly "get the girl". And secondly, if you follow the timeline I believe it would put Daniel LaRusso over the age of 18, so obviously no longer able to compete in the All Valley Under 18 Karate Tournament. 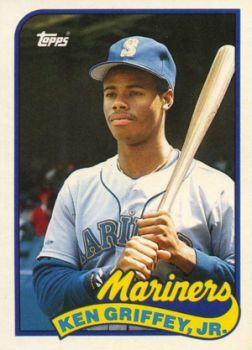 The card is inspired by the 1989 Topps Baseball set - the year the movie was released. I didn't really use any mask layers, I just rebuilt the card with vectors and found a script style font that was passable. The extra "Karate's Bad Boy" sash in the upper left is an additional customization inspired by the 1988 Topps nameplate. I wanted to add that Bad Boy tag line in some way to the card and that's what I came up with. Plus, I think it's the perfect image for that. I'm really happy about the way this one came out and hoping for a TTM success from Sean Kanan.